I visited the White Mountains of New Hampshire last weekend to pre-hike part of the “Hut to Hut Backpacking Trip” that Delaware Nature Society is offering over Labor Day weekend. The scenery and mountain views were incredible! I enjoyed focusing the camera on waterfalls, wildlife and some small wild flower blooms. My trek led me up, up, up a strenuous rocky trail, paralleling multiple waterfalls to the Mizpah Hut through a boreal forest zone. From Mizpah I transitioned into the alpine zone before I got above the tree line near Mt. Pierce (4,310 ft.) Once on the ridge line, the views in every direction were awe-inspiring. While following the ridge line trails, Mt. Washington, 6,288 ft, is always beckoning. Parts of my hike included snow-covered paths through the woods and snow-melt streams running down the trail. Hiking the Presidential Range is truly a fun and challenging experience. 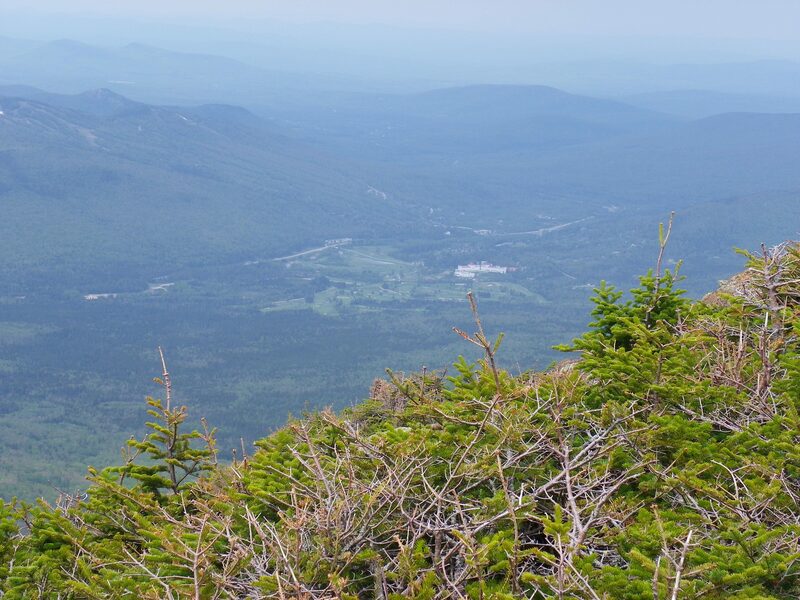 The Appalachian Mountain Club (AMC) will host the DNS trekkers in September. 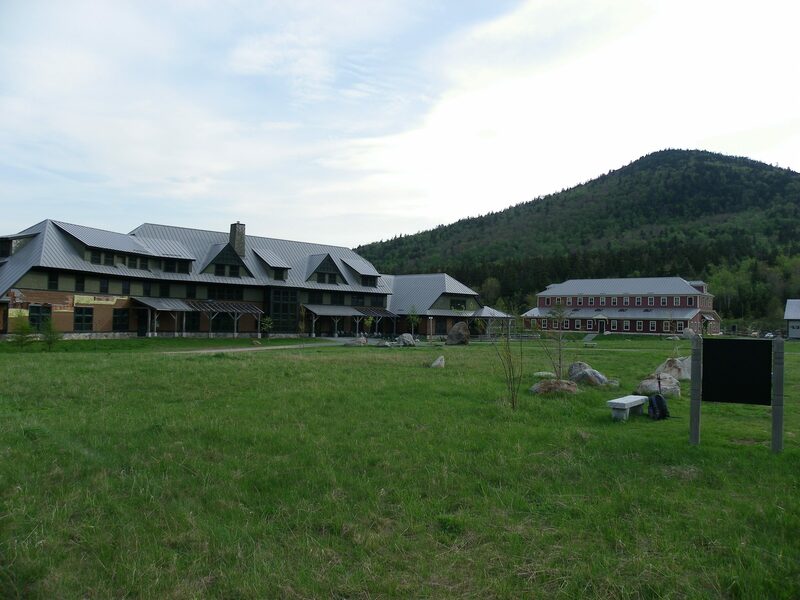 I stayed at their Highland Center at Crawford Notch and thoroughly enjoyed the hospitality and great food! 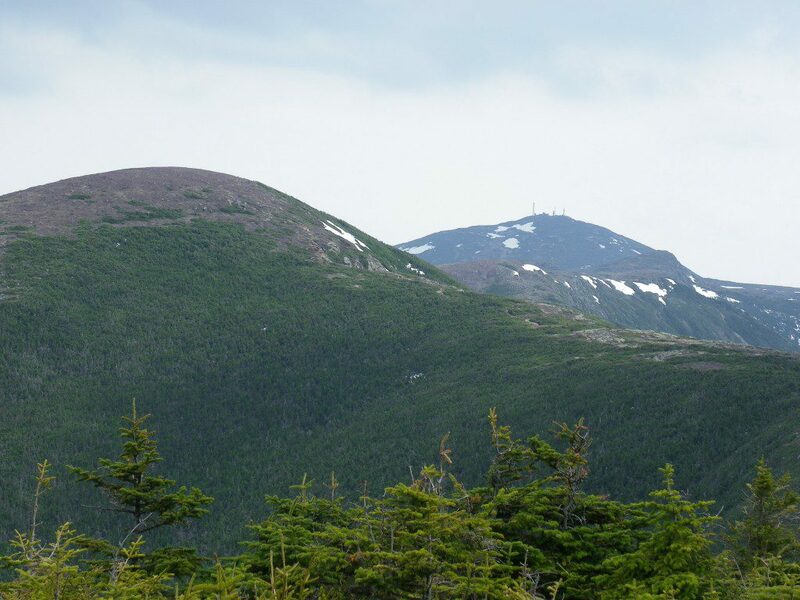 In September, we will start from the Highland Center and backpack to the Mizpah Hut, Lake of the Clouds Hut and Madison Spring Hut; then we will hike back down to their Joe Dodge Lodge at Pinkham Notch for the final night stay. Much of this trip is on the Appalachian Trail. There are still open spots so check out the trip at http://www.delawarenaturesociety.org/travel.html. Enjoy the view from Mt. Eisenhower overlooking the Mt. Washington Hotel. Photo by David Toman. A Yellow-breasted Chat has a lot to talk about at Middle Run Natural Area. Image by Derek Stoner. 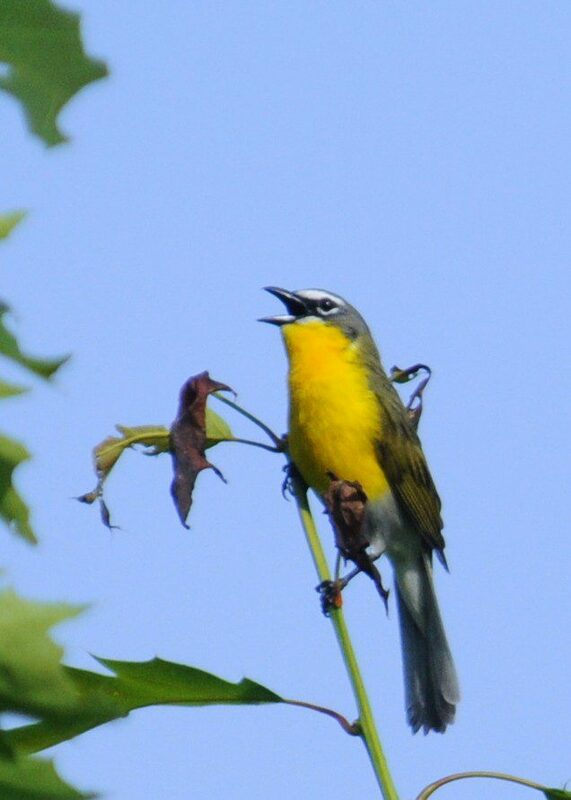 Perched atop a Red Oak, the vociferous Yellow-breasted Chat belts out a gurgling song that sounds like a Mallard crossed with a Mockingbird. 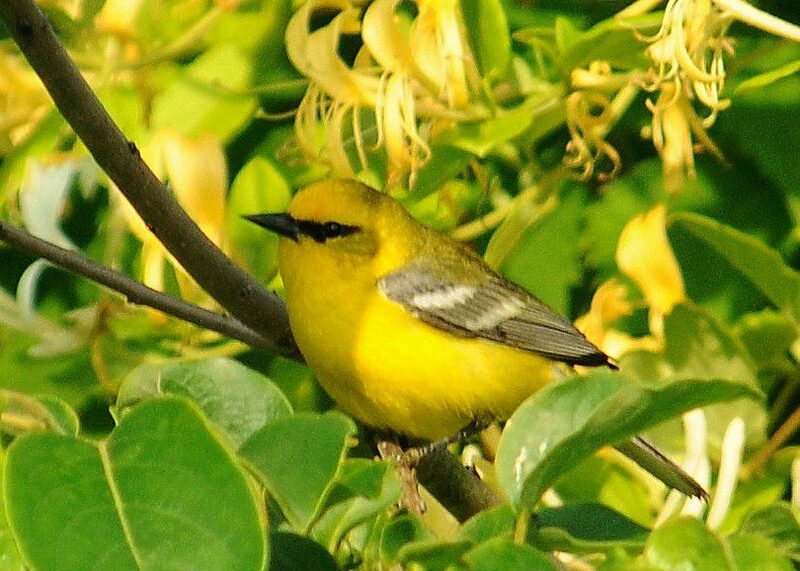 At Middle Run Natural Area in Newark, a close encounter with this bird (the largest warbler in North America) is possible due to the creation of ideal chat habitat: early-successional forest. For the past 20 years, the Delaware Nature Society’s Middle Run Reforestation Project, a partnership with New Castle County Department of Special Services, has resulted in nearly 40,000 trees and shrubs being planted on about 30 acres of the 850-acre county-owned natural area. One of the primary goals of the reforestation effort is to protect the Middle Run watershed ( a tributary of White Clay Creek that supplies Newark with water), by providing a forested buffer that prevents erosion, nutrient pollution, and excessive runoff. Another notable benefit is the creation of outstanding habitat for wildlife. 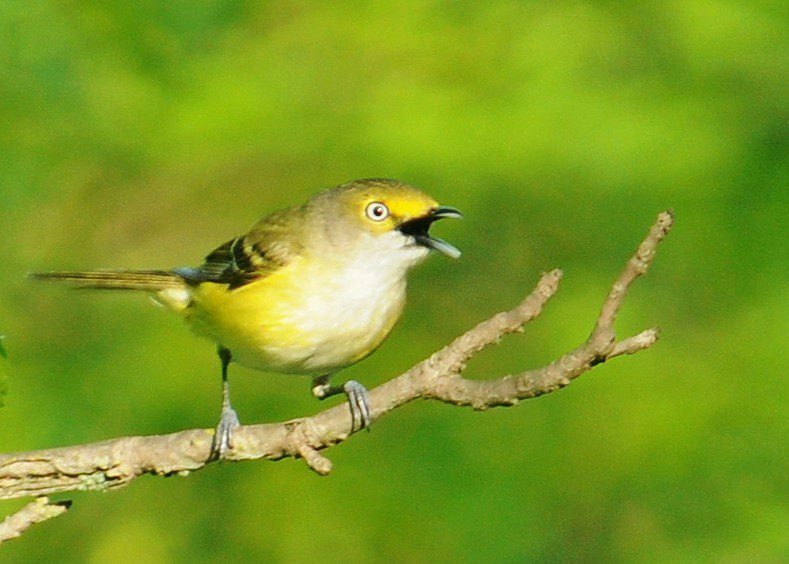 The boisterous White-eyed Vireos rule the thickets at Middle Run. Image by Derek Stoner. In the process of forest development, the earliest stage is when the greatest diversity of wildlife species will utilize the habitat. For the first twenty years of growth, a young (“early-successsional”) forest is a rich mix of trees, shrubs, vines, wildflowers, and grasses. Birds, mammals, reptiles, amphibians, butterflies, and all manner of wildlife benefit from the diversity of food and cover in a young forest. Each spring and fall, volunteers assist with the planting of native trees and shrubs at Middle Run. 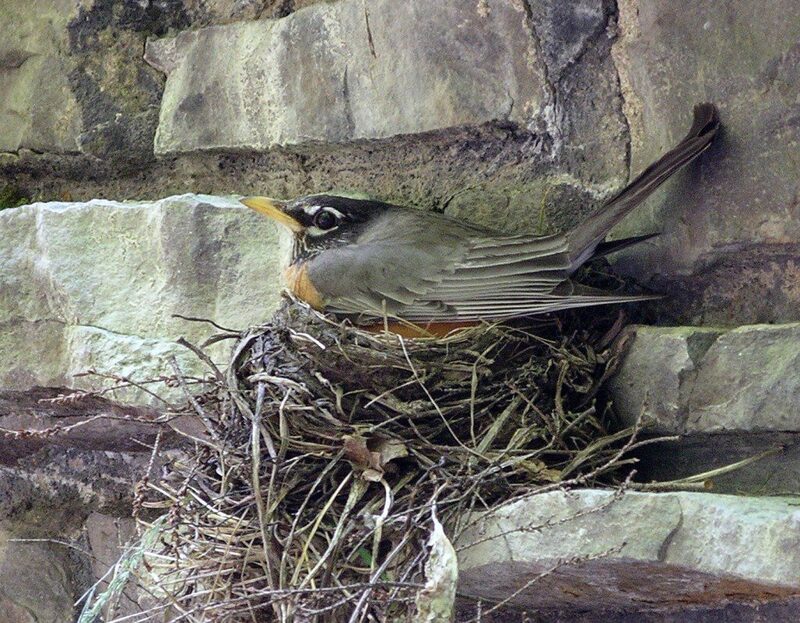 Trees like Red Oak, White Oak, Tulip Poplar, Sycamore, Green Ash, and Red Maple are planted along with shrubs like Serviceberry, Chokeberry, and Viburnum in providing food and nesting space for birds. Many invasive plant species are removed from the plots, but some are allowed to grow in order to maintain a mix of food and cover. Wholesale removal of invasive plants would destroy nesting cover for many critical nesting species. A stunning male Blue-winged Warbler perches against a backdrop of honeysuckle. Image by Derek Stoner. One of the scarcest breeding songbirds in Delaware is the Blue-winged Warbler, a beautiful wood warbler adorned in yellow, blue, and green. The fate of the Blue-winged is closely tied to the availability of young forest habitat, as this species prefers to nest in forest thickets of 5 to 15 years in age. A boldly-marked male Prairie Warbler surveys his territory at Middle Run from atop a wild grape vine. Image by Derek Stoner. 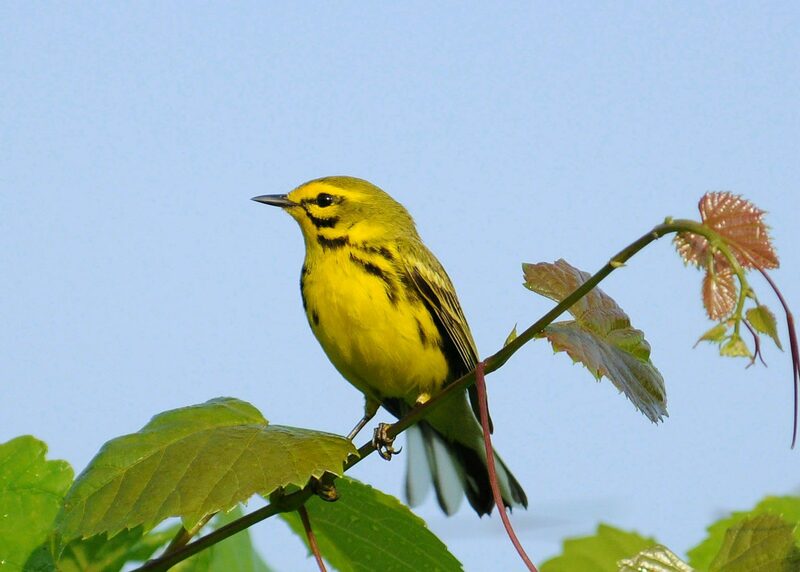 The Prairie Warbler is another species closely tied to the thicket and scrub habitat created by reforestation. The word “prairie” is a mis-nomer, as this bird more prefers the savannah-like habitat of trees and shrubs interspersed with grasses. 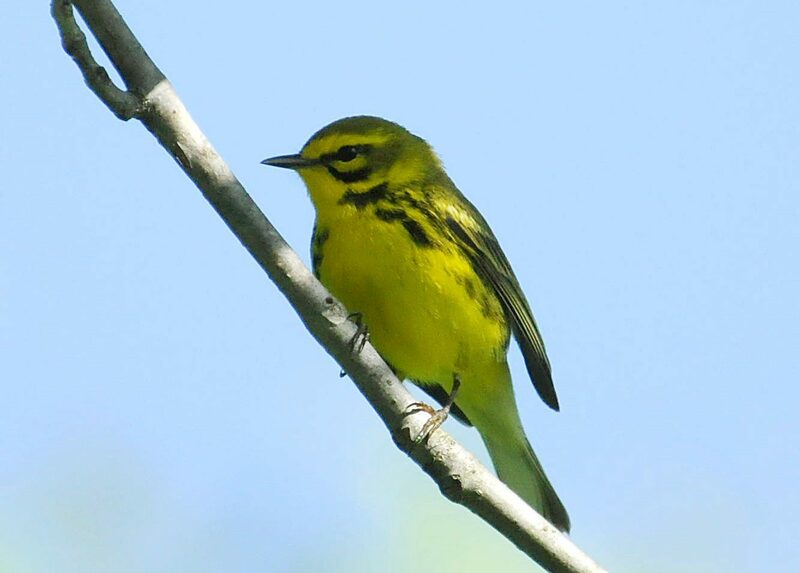 At Middle Run, the Prairie Warbler is a species found in all of the reforestation plots, with at least 10 pairs on territories. 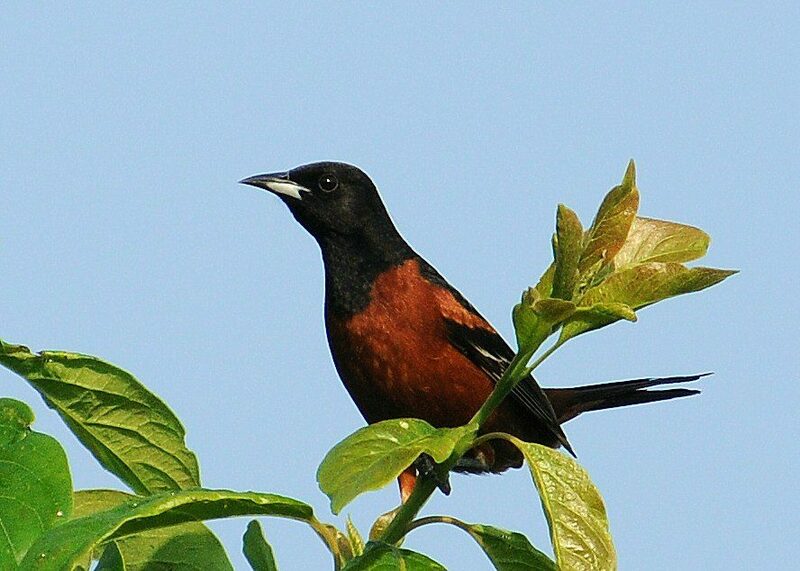 A male Orchard Oriole sings from atop a tree, where his mate weaves a beautiful basket nest. Image by Derek Stoner. Starting in late April, these neo-tropical birds arrive at the reforestation area and start setting up territories. 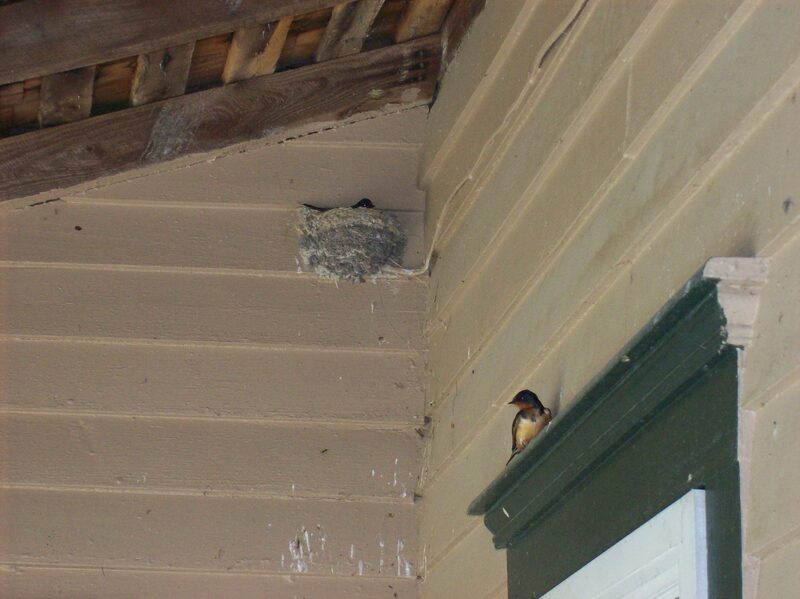 Males sing and display, and females investigate nest sites. Orchard Orioles love the staggered stands of small trees, as their name indicates. Right now, in late May through the end of July, all of these birds are busy with the task of rearing young and helping perpetuate their species. A great place to see these early-successional specialty birds is along the new Middle Run Birding Trail. I designed the trail, which is less than a mile in length and over slightly rolling terrain, to take visitors through the best habitat and to the best places for birding. In an upcoming blog, I will introduce you to the birds that nest in the mature forest along the trail. I invite you to visit Middle Run Natural Area and explore this unique birding trail for yourself. The map below will guide you along the mowed trail. Please share your Middle Run bird observations with us! All images taken by Derek Stoner at Middle Run Natural Area along the birding trail the week of May 23, 2010. The 2nd-annual Bucktoe Bird Blitz took place last Sunday at the Bucktoe Creek Preserve near Kennett Square, PA. 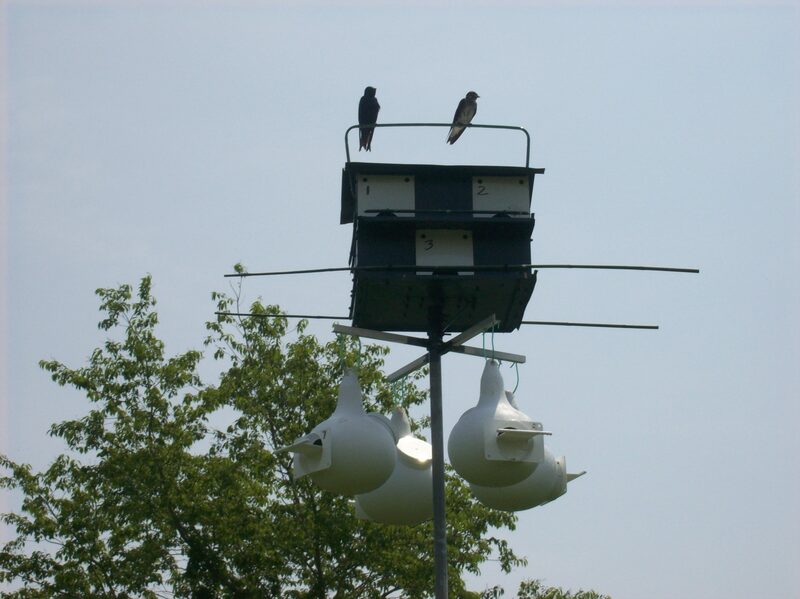 The Blitz is an all-day event where we try to find as many bird species as possible on the property in a day. In 2009, birders found 78 species. This year I had a feeling we would break 100, especially if there were a lot of migrants in the area. Walks were held at 6:00 am, 8:00 am, 10:00 am, 2:00 pm, and 4:00 pm and were led by Larry Lewis, Holly Merker, Sally O’Byrne, Carol Majors, and me. A catered lunch was provided at noon. About 100 birders attended the event. Almost 100 birders attended the Bucktoe Bird Blitz on May 16, 2010. Photo by Ron Sinclair. At 9:00 am, I was still out of town, on my way to the Blitz. I received a phone call from Preserve Director, William Ryan. He said, “All h*ll is breaking loose! 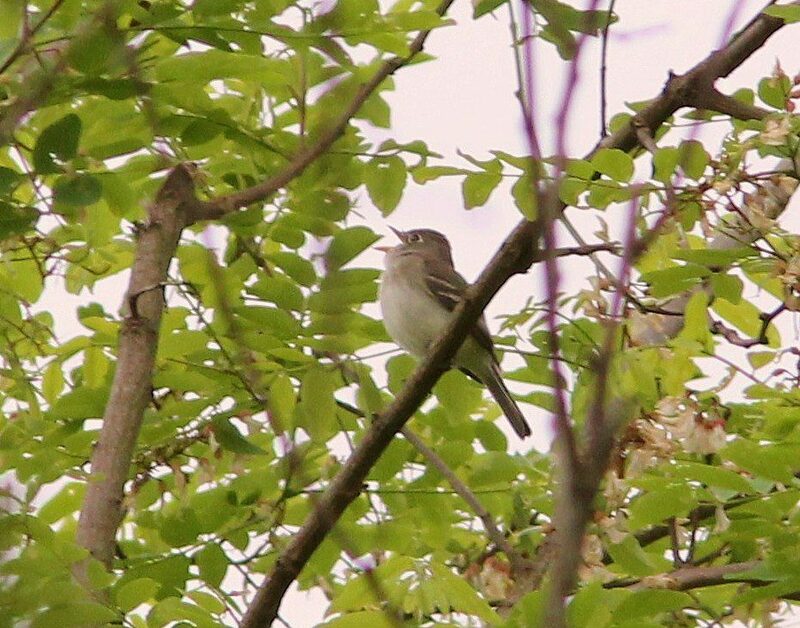 We’ve already seen an Olive-sided Flycatcher and a Least Flycatcher, and both are singing!” He went on to say that more than 15 species of warblers had also been found. My belief that more than 100 species could be tallied was firmed up. 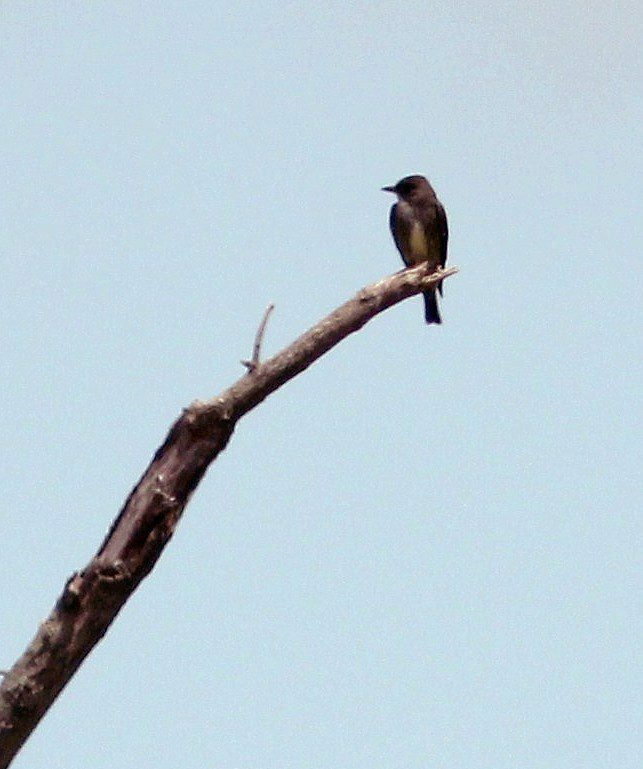 A Least Flycatcher sings its short song, "Che-bek!" to the delight of many birders at the Bucktoe Bird Blitz. Photo by Holly Merker. Olive-sided Flycatcher is always a great find. This bird was singing its "Quick-three-beers!" song, which is not often heard. Photo by Holly Merker. My walk began at 4:00 pm. At that point, 98 species had been found. No pressure here! Birds that were still M.I.A. at that point included a few attainable species like Northern Rough-winged Swallow, Fish Crow, Double-crested Cormorant, Kentucky Warbler and Great Horned Owl. Most of the other species were pretty rare. It was a good thing I had some excellent birders with me. With the help of the group, we came up with a Northern Rough-winged Swallow winging overhead and calling. Next, Holly Merker heard and spotted a perched Lincoln’s Sparrow, which is hard to find locally in spring migration. We were at 100 species! Sharp-shinned Hawk and Yellow-billed Cuckoo put us at 102, then a late-day search party added Kentucky Warbler and Great Horned Owl. 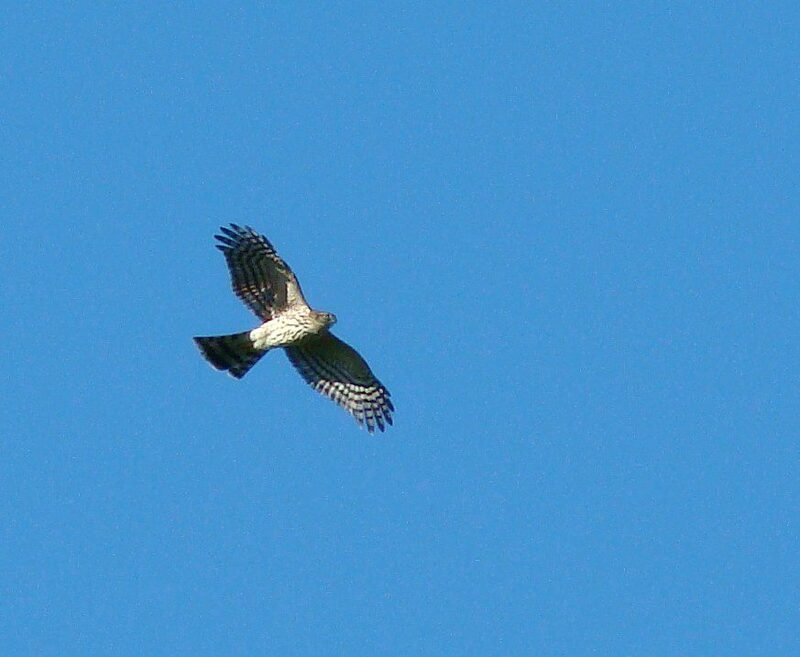 A surprise fly-by at the end of the day was a Sharp-shinned Hawk. Photo by Joe Sebastiani.